Once more, the Trump administration has upset the norms. For decades, scientists have provided expert advice to the White House and federal agencies, helping inform decisions that affect the nation’s health and safety. But, according to a report from the Union of Concerned Scientists released last week, the Trump administration has neglected, suspended, or disbanded many science advisory committees. The analysis examined 73 committees designated as “scientific and technical” across two dozen departments, agencies, and sub-agencies. While agency advising committees varied, and some were still quite active, the report found “an aggregate pattern of failure to adhere to committees’ chartered missions.” The Department of Energy, the Environmental Protection Agency, and the Department of the Interior met less frequently in 2017 than at any time since the government began tracking this data in 1997. The DOE, the EPA, and the Department of Commerce advisory committees also have fewer experts serving as members than at any point in the last two decades. The pattern of marginalizing science advice starts with the president, the report says. Unlike any of his predecessors in the past four decades, Trump still hasn’t named a presidential science adviser who would oversee the now largely dormant Office of Science and Technology Policy. By the end of last year, Trump had filled only 20 of the 83 government posts that the National Academies of Science designates as “scientist appointees”; at the same point in their administrations, President Barack Obama had filled 63 of those positions and President George W. Bush had filled 51. 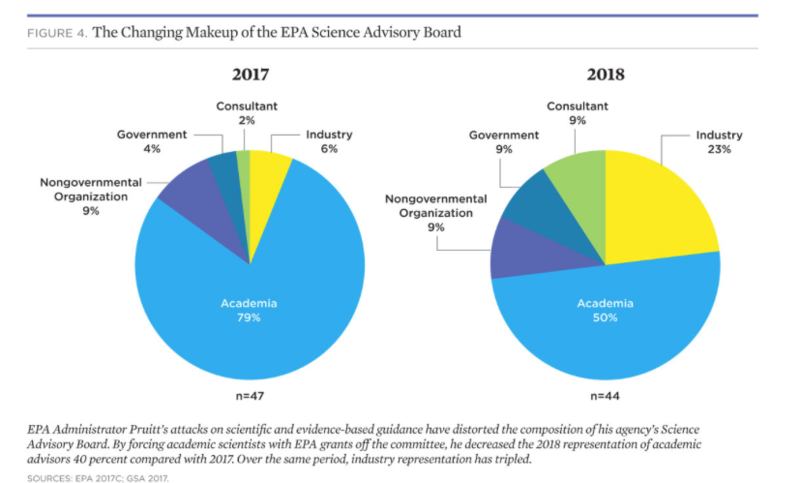 At the EPA, Administrator Scott Pruitt aggressively realigned flagship science boards advising the agency, including the Science Advisory Board and the Board of Scientific Counselors. The Trump administration has also proposed slashing funding for the Science Advisory Board by 84 percent, hindering the work of the 47-member board. Pruitt began his sweep of the boards by breaking with tradition and opting not to renew the appointments of Scientific Counselors whose terms were ending. In May, Robert Richardson, an ecological economist and professor at Michigan State University who for three years served on the BOSC, learned his term would not be renewed. By the end of the following month, 38 of the 49 sub-committee members had been given the same message. The EPA’s decision not to renew membership was “inflammatory,” Richardson said in an email: “The decisions to dramatically reshape and revamp these boards sends a message that the administration does not value the scientific expertise, experience, and level of trust that are associated with members whose terms are not renewed.” Ryan Jackson, Pruitt’s chief of staff, told the Washington Post that board members whose terms are not being renewed could reapply for their positions. In the past, some expert advisers on EPA boards and committees would also receive grants from the EPA to continue their research. In October, Pruitt put an end to this by mandating that EPA grant recipients were no longer eligible to serve on advisory committees. Instead, membership on these committees reflects increased representation of industry interests, the UCS report found. “In effect, people who have studied the issues the most and have been closest to the issues are not eligible to provide advice,” Holt, the CEO of AAAS, said. EPA spokesman Jahan Wilcox said in an email that with the change in administration and “many new priorities for the Agency,” time is needed to “identify and prepare for scientific review.” The agency expects to fully use its advisory committees “to ensure the highest quality independent advice to provide a foundation for the Agency’s policies and decisions,” he wrote. The report details the disbanding of the Food Advisory Committee, a longstanding committee at Food and Drug Administration weighing in on food science, safety and nutrition. It also includes information on a reported “word ban” at the Centers for Disease Control and Prevention, and the disbanding of the Advisory Committee for the Sustained National Climate Assessment in the Department of Commerce. Conservation biologist Beier is not optimistic that will happen. “This is exactly what I expect from this president who clearly doesn’t give a flip about truth and science,” he said. 2017 Was a Big Year for Scrubbing Science from Government Websites. Here’s the List.